IDEC’s XN4E 30mm E-Stop switch now enables the installation of up to twenty personal locks, preventing unauthorised resetting of the latched emergency stop switch and making service or maintenance safer to perform. 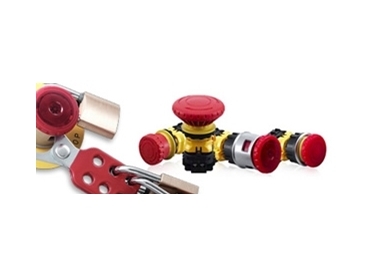 The XN switches, designed with a ‘Safe Break Action’, ensure that the Normally Closed contacts open if the contact block is separated from the switch, which if not communicated will leave operators at risk of accident causing injury or worse. To further provide for the safety of personnel and the integrity of the installation, the ‘Direct Opening Action’ ensures that even if the contacts are welded, the force applied on the button will directly open the contact, and a Safety Interlock Mechanism keeps the contacts open when the operator is locked. The XN series offers a space saving benefit of a short depth behind the panel. They are RoHs compliant, UL-listed, c-UL, TUV and CE marked and comply with ISO 12100-2:2003 standards with a Safety Category rating to 4.